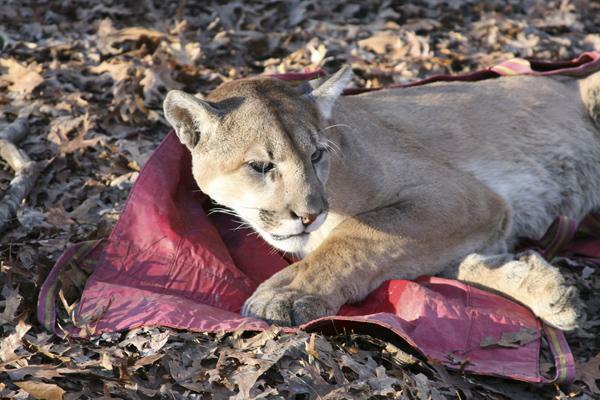 The mountain lion trapped by a private individual in Reynolds County Jan. 4 is seen here recovering from sedatives. 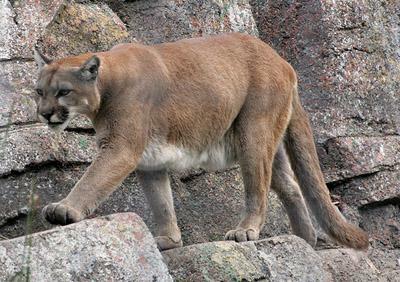 The mountain lion was taken to the Current River Conservation Area for examination and released. Officials say the animal was an estimated 2 years old, showed no signs of being held in captivity and was in excellent physical condition. The Conservation Department does not plan to stock mountain lions but wants to learn more about those in Missouri. Police are searching for a man who broke into a Jefferson County home and attacked a woman - only to face return gunfire from the victim. According to the St. Louis Post-Dispatch, the man came to the home in the 3600 block of Telegraph Road last night and knocked. When the homeowner went to the door he sprayed her in the face with pepper spray. The mask-wearing man then forced his way in and began struggling with the 53-year-old woman. Police say she broke free, ran to a bedroom and grabbed a gun. When the intruder forced his way into the bedroom, she fired several shots. The intruder left. It wasn't clear if he was struck. The homeowner was treated for injuries from the pepper spray but was not seriously hurt. Former Tennessee Titans head coach Jeff Fisher is interviewing for the St. Louis Rams' coaching vacancy. The team is looking to replace Steve Spagnuolo, who was fired Monday after going 10-38 over three seasons. Fisher's Titans lost to the Rams in the 2000 Super Bowl.